Every week we pull together some great Canadian recipes from Canadian food bloggers around the web featuring one main ingredient or dish. We dig waffles for lunch, brunch, dinner - any time really! So here are 15 waffle recipes to try! Waffles are fun to eat, easy to make, easy to freeze and a guaranteed crowd pleaser at breakfast, lunch and dinner (and brunch and brinner - or lupper!). They can be sweet or savoury and a blank canvas for virtually any topping you can imagine. Use them to clean out fridge leftovers or to create a special weekend treat. However you love them, we've got 15 waffle recipes that would be at home any time of day you choose to eat them! A twist on a classic Sunday bagel, why not try **[Smoked Salmon and Dill Waffles](http://www.imagelicious.com/blog/smoked-salmon-and-dill-waffles)** served with greek yogurt, capers and lemon! From **Imagelicious**. There are so many good things about these **[Savoury Mexican Waffles with Salsa Verd](http://www.mykitchenlove.com/savoury-mexican-waffles-with-salsa-verd/)**e - serve with eggs, peppers, cilantro, avocado. A brunch fest for sure! From **My Kitchen Love**. For the beer and bacon lover in your life - **[Beer Battered Bacon Waffles](http://www.livinglou.com/2014/03/beer-battered-bacon-waffles.html)**! From **Living Lou**. Add your morning citrus to your waffles - with **[Orange Waffles](http://www.bakersbeans.ca/orange-waffles/)**! From **Bakers Beans**. A perfect, savoury gluten free waffle - these **[Chickpea Flour and Green Millet Waffles](http://www.cookingsutra.com/besan-bajre-ki-waffles-chickpea-flour-green-millet-savoury-waffles-gluten-free/)** can be enjoyed by everyone! From **Cooking Sutra**. We are basically fans of any additional ways to experience poutine so we love these **[Breakfast Poutine Waffles](http://www.shelovesbiscotti.com/breakfast-poutine-waffles-sundaysupper/)**, which, let's be honest, would be great for dinner too. From **She Loves Biscotti**. The classic tater tot - turned into **[Tater Tot Waffles](http://joandsue.blogspot.ca/2013/08/tater-tot-waffles.html)**! From **Jo & Sue**. All you need to add is a cup of coffee with these gluten-free **[Savoury Crispy Bacon, Cheese & Green Onion Waffles](https://urbnspice.com/my-recipes/savoury-crispy-bacon-cheese-and-green-onion-waffles/)**. From **UrbnSpice**. If you've never had the cheesy beer sauce that is Welsh Rarebit, you are missing out. Creating **[Welsh Rarebit Waffles](http://mdivadomestica.com/2017/03/welsh-rarebit-savoury-waffle/)** is a great idea for breakfast or dinner! From **MDIVADOMESTICA**. Bacon, waffles, maple syrup and ice cream make this **[Brunch Sundae](http://www.bitememore.com/feedme/458/brunch-sundae-recipe)** a perfect Sunday morning treat! From **Bite Me More**. Chicken and waffles go together like PB&J so why not turn them into a sandwich like this **[Strawberry Sunrise Chicken & Waffle Sandwich](https://foodmeanderings.com/2017/03/14/healthy-waffle-chicken-sandwich/)**. From **Food Meanderings**. Have you ever tried quinoa in your waffles? Give these **[Cheesy Quinoa Waffles](https://www.smartnutrition.ca/recipes/cheesy-quinoa-waffles/)** a try! From **Smart Nutrition**. 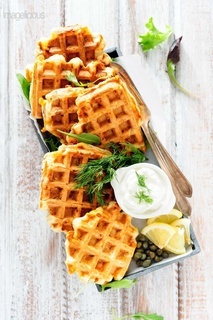 Waffles made with ricotta can make a nice change - try these **[Savoury Ricotta Chive Waffles](http://www.breakfastfordinner.net/savory-ricotta-chive-waffles/)**. From **Breakfast for Dinner**. And last but certainly not least, a paleo friendly take on waffles with these **[Cassava Flour Waffles](http://www.frompastatopaleo.com/from-pasta-to-paleo/2016/7/12/cassava-flour-belgian-waffles)**. From **From Pasta to Paleo**. A big thank you to all our FBC Members who participated in this week's waffle recipe roundup!